Fatah holds party celebrating terrorist's release, flies PLO flags - in Lod. A few days ago, a party was held celebrating the release of Hafaz Abad al-Fatah Mukbal, a terrorist who spent 15 years in jail after committing a terror attack at the Maccabim checkpoint in 2000. Mukbal was also found to have illegal weapons. According to the MEMRI report, Fatah held parties celebrating the terrorist's release in Arab neighborhoods of Jerusalem and in the terrorist's hometown of Lod. 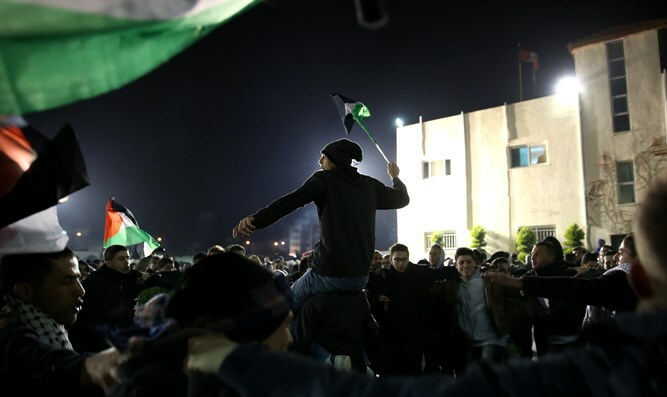 MEMRI also reported participants in the celebrations flew PLO and Fatah flags, lifted Mukbal up on their shoulders, and organized a parade to celebrate the "victory" of the Arab scouts, the terrorist's family, and the Arab residents of Lod. Fatah member Aood al-Salima participated in the Jerusalem celebration and said, "Those imprisoned in Israeli jails are a the top of the Palestinian National Leadership's priority list. "We will not rest until all of our brave prisoners have been released." Jerusalem Prisoner's Club leader Nasser Kous said the prisoners represent "true discipline, sacrifice, and willingness to stand up for principles in order to lead honorable lives in our homeland, which the occupiers are trying to Judaize." "My happiness is not complete," terrorist Mukbal said. "I left behind in the occupiers' jail my imprisoned brothers, who suffer from difficult conditions imposed on them by the Israelis." In fact, imprisoned terrorists enjoy comfortable VIP conditions in Israeli jails - and are even able to receive a university degree free of charge. In contrast, prisoners in Palestinian Authority (Fatah) and Hamas prisons are often tortured. MEMRI also reported that Mukbal was visited by Fatah leaders, who arrived in his Ramallah home and later held a party for him in the city. PA Prisoners' Division Head Isa Karaka and PA Prisoners' Club Head Kadura Paras had their picture taken with Mukbal. The three posed in front sign saying, "The Palestinian Prisoners' Authority and the Palestinian Prisoners' Club welcome our freed fighter, Hafaz Mukbal."